Reader Recommends is a fun meme created here at Ramblings on Readings where we recommend 3-5 books (or more!) based on certain given topics. This is a great way to see what other readers are enjoying in your favorite genres, or maybe find a new favorite series! 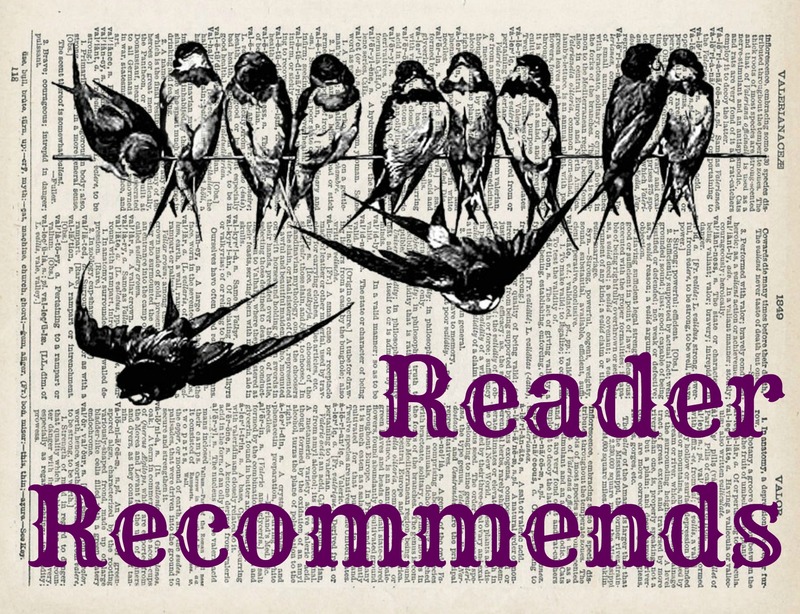 Every Thursday, I’ll be posting the current Reader Recommends, along with the topic for the next edition. Choose up to five books or series you would recommend based on the topic or genre. If you haven’t read the topic, you can post books you are interested in reading based on the topic. You’ll find next week’s topic at the bottom of this post.Add your post to the Link-up at the bottom of each Reader Recommends post to see other bloggers’ suggestions, and make some new friends! Be sure to comment on my post if this is your first time so I can be sure to stop by your blog! Zombies have never really been the “it girl” of the YA sphere like vampires or dystopia have been. Maybe its the whole, rotting flesh, eating your brains bit. They are much harder to have a romantic relationship with (Unless you’re reading Warm Bodies), which is the creme de la creme of YA – lets take this weird, terrifying thing and put our heroine in a romantic relationship with it. Anyway. Let’s see what our experts at Ramblings on Readings recommend for Zombie books! This is my favorite zombie series. Heck, it’s one of my favorite YA series. I really need to finish it; it’s a post-apocalyptic series with oodles of character development, lots of great action (swordfighting! ), terrifying villains (who aren’t zombies), a dash of romance, all happening while trying to survive in a zombie infested wasteland. It’s pretty ridiculously awesome. This one is much more YA Romance with some Zombie Action added in. No, it has almost nothing to do with Alice in Wonderland. Let’s just get that out of the way. It’s about a girl who can see spirits (Zombies), and if they bite you in your spiritual form (the only form you can fight them in), you get infected and turned into a zombie yourself. Lots of fun action here, with a lot of YA Relationship drama, and a dash of mystery. Fun characters, fun dialogue. This is kind of a loose interpretation of Zombies; the bagmen (zombies) don’t even show up till later, but they are terrifying and very problematic. This series is an amazing and entirely unique premise based on Tarot; post-apocalyptic action, supplemented by a Ramblings on Readings approved Love Triangle (how unusual!). Kresley Cole is not afraid to throw some dark stuff at her readers. Approach this one with caution. But still approach it, cause it’s AWESOME. I really liked the movie they made from this one, so I’m sure I’d like the book. It’s been on my to-read list for a while. This one has also been on my to-read shelf for a while; honestly, the cover is probably one of the things that has kept me from picking it up, since I’m so drawn to amazing covers and this one is just kind of…meh. But I know Amanda Hocking is a pretty well known YA author now, so I may pick it up in the future. I’ve almost picked this one up multiple times, but I’m super reluctant to pick stuff up that has a Good Reads Rating lower than about 3.7, unless it’s a NetGalley or a Review Request. Anyone read this and loved it? I’ve been interested in reading it for a while. –You know the one. Maybe it’s an indie gem that had a terrible amateur cover design. Or maybe it got lost in the shuffle of a big publishing house and ended up with a lame cover. Whatever the case, these books are out there, and for people like me who are drawn to gorgeous covers, that’s a death trap for these poor novels. Which books do you love but think need a cover redo? This entry was posted in Reader Recommends, Uncategorized. I REALLY suggest Something Strange and Deadly by Susan Dennard, The Gathering Storm by Robin Bridges, and Dearly, Beloved by Lia Habel! I loved them all! I really want to read Rot and Ruin! Something Strange and Deadly is literally sitting on my shelf right now lol; I had no idea it was zombies (I picked it up because of the cover, I haven’t even read the blurb lol). And I’ve had Dearly, Beloved on my to-read list for forever! I’ll check out Gathering Storm! I LOVE ROT AND RUIN. You should definitely read it! I loved Poison Princess! It’s on my list too!